A campaign that tapped into the university market through integrating Out Of Home advertising with native content delivered Contiki a three-fold increase in bookings. 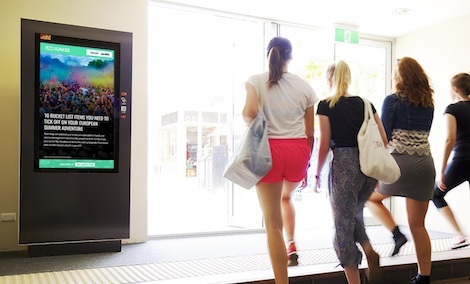 The campaign to push Contiki’s 2018 European packages included customised creative based on time and day running on Locate by oOh!’s Study digital screens across 99 university campuses nationally, coupled with a three-part native content series on Uni Junkee that was amplified on the panels and via Facebook. The native content developed by the Uni Junkee team was based around mid-year breaks, money, hacks, bucket lists and experiences. These were published online, amplified on social and republished on Study. Over 2,500 shares of Uni Junkee’s native content. oOh! is a leading operator in Australia and New Zealand’s fast-growing Out Of Home advertising industry. They create deep engagement between people and brands through Unmissable location-based media solutions. Their portfolio is unparalleled, with a diverse set of static and digital signs across roadside, retail, airport and place based media offering in CBD office towers, cafés, fitness venues, bars and universities. They combine this extensive reach with sophisticated data, industry leading insights and world leading digital innovation, integrating their physical inventory with experiential, social and mobile online channels to provide clients with greater connections with consumers. This entry was posted on Wednesday, November 22nd, 2017 at 06:33 @315 and is filed under DailyDOOH Update. You can follow any responses to this entry through the RSS 2.0 feed. You can leave a response, or trackback from your own site. TechLink Services LLC Acquires Blue Ridge Solutions Inc.